The Old Bakery Bed & BreakfastThe Old Bakery is a warm and friendly B&B situated in the delightful village of Georgeham, less than 1 1/2 miles from the world famous beaches of Croyde and Putsborough/Woolacombe. We have three bedrooms, all with en-suite facilities: one twin room, one double room and a flexible twin or double room using two divan beds. This room also has a sofa bed that can sleep up to two extra people. In addition, guests can use the kitchen throughout the day once we have finished serving breakfast giving a flexible self catering option. Groups booking all three rooms can opt to fully self-cater and should contact the owners to discuss. 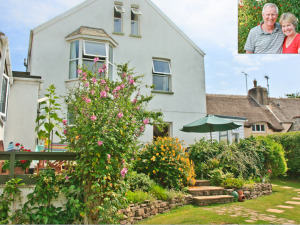 A warm and friendly B&B less than 1 1/2 miles from Croyde and Putsborough with three twin/double bedrooms, a guest lounge, dining room and kitchen which can be used by guests. The kitchen is available for use by guests after breakfast has been served, Children welcome from any age. The Old Bakery sometimes limits bookings to 3 or more days. 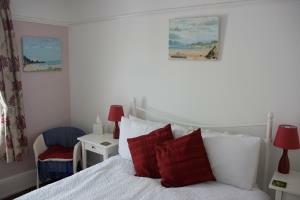 Barricane is a lovely double room located on the first floor. It has a good sized en-suite bathroom complete with roll-top bath. As with all our rooms there is a TV with built-in DVD player and a kettle with a good selection of beverages (various teas, coffee and hot chocolate). There is also a hair dryer. Please note children are charged the same rate as adults and should be entered as adults to calculate the total cost. Infants for whom you provide all bedding and food are free. A deposit of one night's stay for each room is required to secure a booking. We welcome payment by bank transfer and our account details will be provided at time of booking by email. Alternatively you can pay by debit or credit card over the phone (including American Express) or cheque made out to "The Old Bakery" . The balance can be paid by bank transfer or by cash, cheque or card during your stay. See our T&C for details. Infants in cots are charged £10 per night. We have one high chair but do not have any cots and parents must provide all bedding and food. Barricane sometimes limits bookings to 3 or more days. We are in the centre of Georgeham behind the village store and Post Office. Follow the A361 round Barnstaple to Braunton, then signs to Croyde and then Georgeham. A map of how to find us once in the village will be sent to guests prior to arrival. David and Pippa were very hospitable and accomodating, we were made to feel very welcome and enjoyed the comfortable, clean room/bathroom and delicious cooked breakfast. Many thanks David and Pippa. The Old Bakery has a ground floor bedroom with en-suite shower room that would suit guests with limited mobility. The en-suite shower has a low profile tray, grab rail and seat making it suitable for people with impaired mobility and use a manual wheel chair, but but it is not a wet room and is not a fully equipped disabled facility. The guest lounge is adjacent the bedroom and on the same level. There is a single step down in to the dining room. There is a patio at ground floor level, then a garden down a further 3 steps. Any special needs should be advised at time of booking.